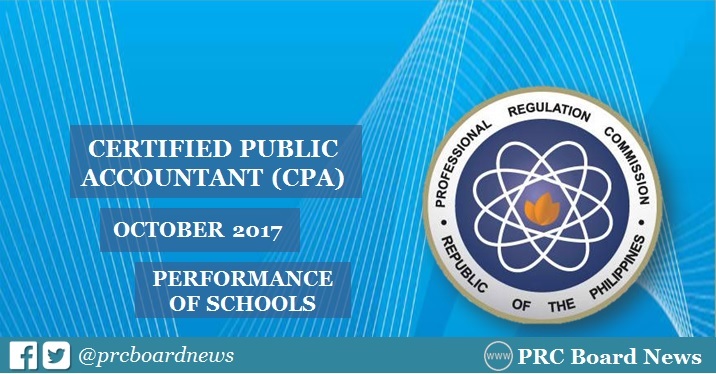 MANILA, Philippines - (Updated November 2) The Professional Regulation Commission (PRC) named the top performing schools in the October 2017 CPA board exam. The result is officially released today,November 2, 2017 or in 10 working days after the exam. University of the Philippines (UP) - Diliman topped the board with 100% passing rate or 69 of its examinees passed the exams. De La Salle University (DLSU) - Manila placed second with 92.66% or 101 out of 109 successfully hurdled the exams. PRC administered the Certified Public Accountant (CPA) licensure exam in the cities of Manila, Baguio, Cagayan de Oro, Cebu, Davao, Iloilo, Legaspi, Lucena, Tacloban and Tuguegarao on October 7, 8, 14 and 15, 2017. Meanwhile, here's the performance of schools in the October 2017 CPA Licensure Examination in alphabetical order as per R.A. 8981 otherwise known as PRC Modernization Act of 2000 Section 7(m) "To monitor the performance of schools in licensure examinations and publish the results thereof in a newspaper of national circulation." In the October 2016 CPA board exam, University of the Philippines - Diliman (UPD) topped the schools with 100% passing rate or 69 examinees passed. It was followed by University of Santo Tomas (UST) with 90.72% or 352 out of 388 successfully hurdled the tests. In the October 2015 exams, UPD also led the schools with 98.70% or 76 out of 77 passed. UST ranked second with 95.29% or 364 out of 382 of the examinees got passing marks. "Due to the cancellation of government office work this week which resulted in the delay of the processing of PRC work, the new release date of the results of the October 2017 CPA Examinations will be on November 2 or 3, 2017, instead of the previously announced date of October 20-21, 2017," the Professional Regulatory Board of Accountancy shared on Facebook. Amazing blog post,It is the interesting method to express or depicted your sentiments to make the sketch artist picture and students easily get you can try here to improve their work. The significance of this sketch artist picture is that individuals did not feel enthusiasm and they comprehend your genuine message. In any case, you completed an effective occupation. Wonderful post,Geeklog give us the brilliant articles as well as, it is a standout amongst the best destinations to buy the item on the web but you can visit https://www.professionalthesiswriters.com/academic-writing-tips-from-professional-thesis-writers/useful-thesis-phrases-from-professional-thesis-writers/ to manage your task. I buy bunches of things on the web however the nature of the item isn't great yet the result of this website is phenomenal quality. Thanks for sharing such type post,It is great data about the life of the specialist but you can visit https://www.writemylitreview.com/faq/ to manage your task. The operator is the individual who goes through our time on earth to spare the nation and attempt to discover the general population who can decimate the tranquility of the nation and need to bring the eagerness for the general population.